Whilst the WordPress SEO by Yoast panel can help improve the visibility of your Post and its content, it is important to understand exactly what is involved in writing SEO optimised copy as not every website you write for will have this option available. Writing Posts in WordPress that adhere to good SEO practices is something that will come with time and practice. Before testing how SEO friendly your Post is, you first need to think about the keywords people will be using to find your article. Keywords are what people put into search engines when looking for something specific online, but how do we know what those keywords will be? Unfortunately, you can never be certain the exact keywords people will be using, different people will search for different things. Your keywords (or keyphrase) should summarise the main subject in your content – think about who your target audience is when choosing your keywords. When adding new Posts you should be able to see that the Yoast Seo panel on your editing page. 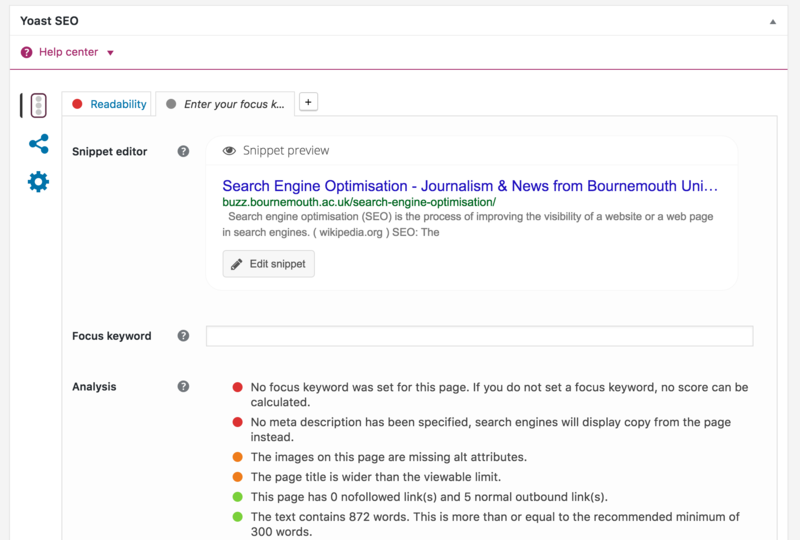 The Snippet Preview at the top of the Yoast SEO box gives you a preview of how your Post will appear listed in Google or other search engines. Using the fields under the Snippet Preview we can alter the visibility of the Post and improve how it appears in search engines. 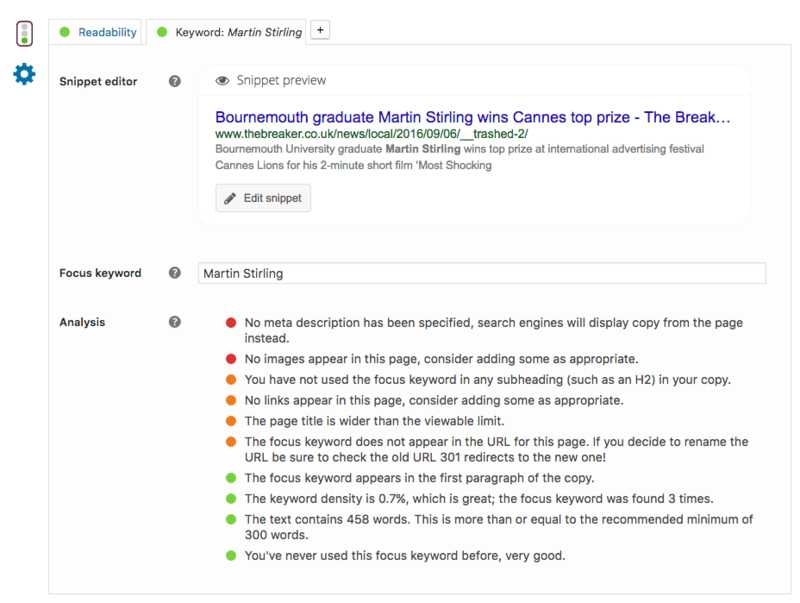 To begin the process of analysing your Post, enter a keyword into the Focus Keyword field – The keyword should reflect the main focus of the content of your piece. Once you have entered your ‘Focus Keyword’, underneath a list of bullet points should appear, instructing you on things you have done well, and not-so-well, with regards to SEO. Make your way through the list and make alterations to your post as necessary (remember Journalism comes before SEO). Be sure to always think about the SEO Title, Slug and Meta-description and the words they should include – these can all be altered through the ‘Edit Snippet’ button.